Okay, maybe that's not what the actual PR says. But it should be! 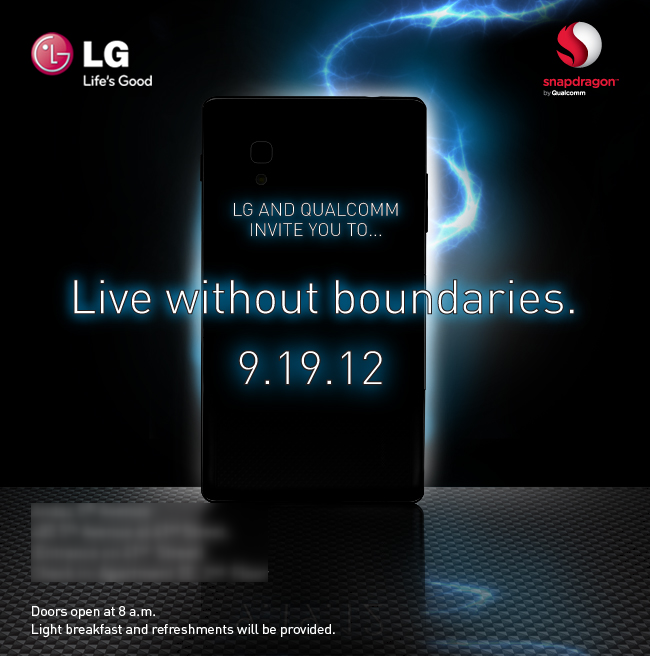 Instead, we just received this invite from LG and Qualcomm, inviting us to "live without boundaries." LG and Qualcomm cordially invite you Live Without Boundaries. This exclusive event takes place on September 19 at [REDACTED], where you will receive a first-hand look at an upcoming LG smartphone. LG and Qualcomm executives will be on hand to show off the device and discuss how this partnership is taking both companies to new heights. The event is six days away and aside from a glimmering silhouette in a black void, we don't have much information on what this device will be. It's likely, though, that it will be the Optimus G the company has been quietly releasing videos of. As evidenced by the fact that it will probably pack some kind of Snapdragon processor. Otherwise, it'll be pretty awkward for Qualcomm to be on stage at this event. So, who's excited for a new LG phone?